Long time business consultant and speaker Winston ‘Winno’ Marsh interviewed me early this month about the top sales mistakes that B2B salespeople make. I see these in businesses that I engage with – be that as a Customer or when I’m asked in to re-engineer their Sales Processes. Some of what I say in the interview may come across as ‘very different’ to what you read in popular sales literature and books, – however, my new methods are what is actually working right now in the marketplace, as it is road-tested. I want to thank Winston for the opportunity to ‘jump on my soapbox’ about this critical aspect of B2B Selling for today, as I’m somewhat passionate about it! 01:00 Focus on the 3 key things – making life easier, take it off their worry list or make them look good. Are you or your team inadvertently making any of these mistakes in your sales process? If so, you would be far from alone in that regard. The good news is, you can be ahead of the pack by re-engineering your Sales Process to follow the POO strategy I talk about in the interview. Winston: I’ve known our next guest, Colin Bockman, for many, many years. And during that time, he’s trained more people to sell more effectively than you and I have had hot dinners, and he does it really well. So I always like to chat with him because he’s got something interesting to say. In fact, I got to talking to him recently and here is what we talked about. Many people in the selling game, particularly when they’re selling to businesses, make mistakes that impair their results. What are the sorts of mistakes they make? Colin: Well the first one is the real value of the offer gets watered down in this belief, is eroded by the buyer’s negativity. In other words, they get pounded by the buyer that they’re the same as everybody else. The tip is to continually pair down their offer to ensure that they focus only on the three key things that are ideal for the customer – that will make life easy for them, take it off their worry list, or make them look good, because they are the reason people buy. Winston: So continue to sell the three most important benefits to that customer. Colin: Which all it went to that, making life easy for them, taking something off their worry list, maybe putting it on to take it off, and making sure the customer looks good if they make that decision everything surround those three factors. Winston: Okay. What’s the next problem they face? 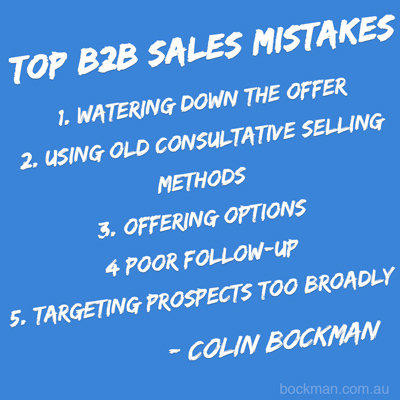 Colin: Stop using the consultative selling methods. The buyers know the right answers. Winston: What do you mean by that? Enlarge on that, for me. Colin: Well when they ask questions like “would you like to do this?” or “do you do that?” The customer knows what the right answers are to get out of the sales process, so don’t ask the questions. 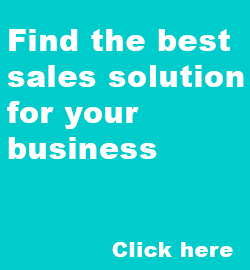 Don’t use consultative selling anymore. Winston: So what do you do? Colin: Okay, you need what we call profile selling. You go in the customer and you say “I know these things about you, because you look like, smell like, taste like” or “because you have this amount of hoists” or “because you service this market segment, because you do these things.” You make a statement about three things that you know about their profile that are absolutely ideal. You tell them nothing of value, but they know that you understand their profile. Winston: That means you don’t ask any silly qualifying questions. Colin: No, out the window. Old hat. Don’t ask qualified questions anymore. It doesn’t work. Customer knows the right answers. You got to tell them that you understand their profile and then show them your offer, relevant to their profile and nothing else because that takes about 5-10 minutes and that’s all you’ve got. Winston: Wow! Okay, another one of those mistakes. Colin: Way too much comparative quote and hope, and not enough one solution belief is used. In other words, stop offering multiple options. There’s just one solution and it’s your solution based on their profile. Winston: And have real gravitas about it. Be serious. Make sure you stay there, isn’t it? Winston: And we used to teach people, didn’t we, to say “do you want the red one or the blue one?” And I suppose that gets to be “do you want this or that?” It’s all over the place. Colin: Don’t do it anymore. It used to work, doesn’t work anymore. Winston: That’s right. Time changes everything. Number 4, Colin. Colin: Our world, Winston, is about speed and everything’s instant. Phones, everything’s instant. So our whole psyche is changed to be instant and not to be evaluation, but to be instant. And that’s what drives us. Limited follow up is the norm with people. So if you’re going to do some follow up, you’ve got to make sure that’s purpose-driven. Never ever make a phone call and say “Hi, just give you a call if you made a decision.” Worst thing in the world to do. Customer goes “yes, I have. It’s not you. It’s somebody else. Hang up.” And they haven’t really made a decision. That’s a way of getting away from you because you’re sales generic. Winston: So you’ve got to do better than just follow up, do you? Colin: Absolutely. Followups have got to purpose, absolute purpose. Golden rule when you have a contact with a customer, be it send them something, an email, go and see them, phone call, whatever, at the end of that contact you spend a couple of seconds, you write down in one line what happened, and the next line you write down what the follow up will be and the date and time based on that conversation. That could be 24 hours later, it could be an hour later, it could be two weeks later, and the purpose of that contact. So every contact has got purpose and appears to be spontaneous, not scheduled by a computer. The more scheduled by a computer, the more sales generic, the less trust, the more they split the dummy, and you don’t get the business. Winston: Wow! And number 5. Colin: Too often, prospect is too broad, instead of being arrow-sharp. 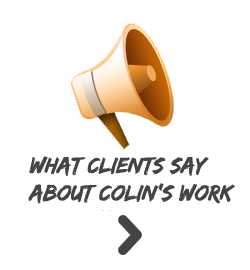 You’ve got to target prospects today so that you can say you understand their profile and you have comparative scenarios of their profile that you know of or have experienced this or have planned for or know about or have researched. Whatever it is, you’ve got to say “I’m targeting you” as if you’re almost the chosen one, because otherwise you’re wasting your time prospecting. People are just so good at negativity, rejecting you, and I call it the rep is going in, they spray themselves with rep-a-guard, and it repels reps. It’s back to the POO system, profile, offer, outcome. Tell them you understand them, tell them what the offer is relevant to their profile, show them the outcome, and don’t use old selling methods. So when you’re prospecting, if you can’t see how you can do those three things, don’t contact the person because you’re wasting your time. Winston: So you’ve just about demolished everything the average rep selling to a business does Colin, you’ve got to change their mindset. How do you go about doing that? Colin: Most times, what I do with organizations is I sit down, I work out what their offer is, first thing is I sit down and have a look at their offer and how they see it, and then I have a look at how their customers see their offer, then I have a look at how their reps see their offer, and then I have a look at how we might need to massage that offer to make it presented at a different way and I show them how to go and present that offer to the right profile without using the normal tools. In other words, we don’t use brochures anymore. We don’t use pamphlets anymore. We use 1 sheet of A4 paper and we spend 5-10 minutes and we nail it in that 5-10 minutes, totally different from what everybody else does, and then we bring in the brochures, then we bring in the backup support, then we bring it in. But you got to get an inconcept sell first, you need to do a little bit of research before you can show people how to do that. Winston: So that’s something they got to take on board and something they’re going to learn from a person like you, Colin. Colin: Yeah. It’s something I’ve designed over probably the last few years as I worked out how it’s evolved, and now I’m using it across a number of industries and we’re quite proud to say with significant success, anything from selling a motor-vehicular workshop to become a part of a group, to selling a part to somebody, to selling a bed, to selling some equipment to somebody. They’re just ones that come top of mind. And in each case where I’ve done that, we’ve had significant increases. I’m talking 25%-30% difference in the first four weeks. And in one case, we had a situation where the supplier ran out of stocks in four weeks, and I’m talking millions of dollars of stocks. Winston: What’s your favorite success story, Colin? I’m sure you’ve got one. Colin: Well it’s probably that one with the guy that ran out of stock. We actually ran it with 100 reps who were calling on mechanical workshops and they couldn’t sell the higher quality hoist. The Chinese import cheap one was killing the market. So I designed the way of doing it and showed all these 100 guys throughout the session how to do it and went out there. Within 4 weeks, the supplier had literally run out of stock. The people who were doing the credit had a 300% increase in the amount of business they were writing, and that we’re just highly successful. But the important thing about that story is that they learned the process. They were then able to apply that to a whole lot of other products for a whole lot of other sections where they’re selling because once they understood the process and the psyche behind it and how to do it, and it involves colored pens and all kinds of tricky things but it’s easy to do. Once I understood it, they’re able to draw the parallels and apply it elsewhere. And so their success has been significant. And if I was paid on a percentage of the amount of money that they made, I would not be working today. Winston: Perhaps you better change the way you do it, Colin. Winston: Colin Bockman, fantastic information from Colin. And I thought I should just remind you of the mistakes he reckons people make when they’re selling. They water down the offer. They use consultative selling methods, old fashion he reckons. They offer options, which everybody has been taught to do and shouldn’t. And they do very little follow up or limited follow up. Bad, bad, he says. And they target prospects too broadly. 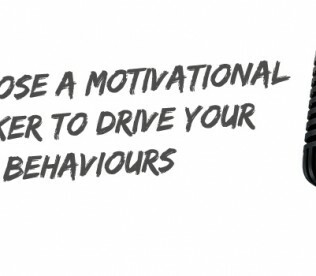 So they are the five problems that most sales people have and it’s worth having a chat with him if you really want to get into his new style of selling. I know that it works. Not only have I heard what he talked about there. I’ve heard other results from him. 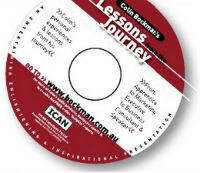 So if you want to contact Colin, his email is colin@bockman.com.au. Of course the website is bockman.com.au. The phone number is 0418-318-799. From overseas of course, that’s 61418-318-799. Now, the best thing you can do and what I recommend is to call Colin and have a chat. He’s very infectious. His ideas are great. And I think you’d benefit from it. And I think he’s probably happy to sit down and help you analyze your situation for an hour or so to see whether there’s anything he can do to help you build your business, and I’ll bet that he can.